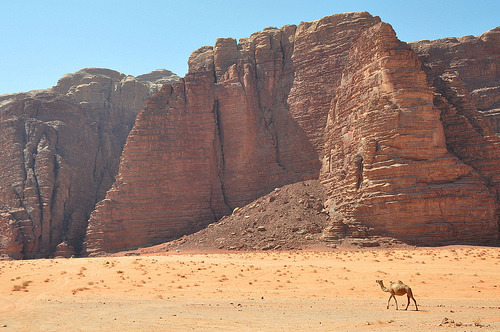 In the West, Wadi Rum may be best known for its connection with British officer T. E. Lawrence, who passed through several times during the Arab Revolt of 1917-18. 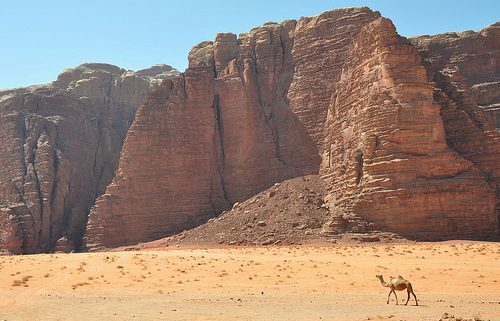 In the 1980s one of the rock formations in Wadi Rum was named "The Seven Pillars of Wisdom ” after Lawrence’s book penned in the aftermath of the war, though the ‘Seven Pillars’ referred to in the book have no connection with Rum. The area is centered on the main valley of Wadi Rum. The highest elevation Jordan is Mount Um Dami at 1,840 m (6,040 ft) high, located 30 kilometers to the south of Wadi Rum village. It was first located by Difallah Ateeg, a Zalabia Bedouin from Rum. On a clear day, it is possible to see the Red Sea and the Saudi border from the top. Jabal Rum (1,734 metres (5,689 ft) above sea level) is the second highest peak in Jordan and the highest peak in the central Rum, rising directly above Rum valley opposite Jebel um Ishrin, which is possibly one metre lower. Khaz ali Canyon in Wadi Rum is the site of petroglyphs etched into the cave walls depicting humans and antelopes dating back to the Thamudic times. The village of Wadi Rum itself consists of several hundred Bedouin inhabitants with their goat-hair tents and concrete houses and also their four wheel vehicles, one school for boys and one for girls, a few shops, and the headquarters of the Desert Patrol.